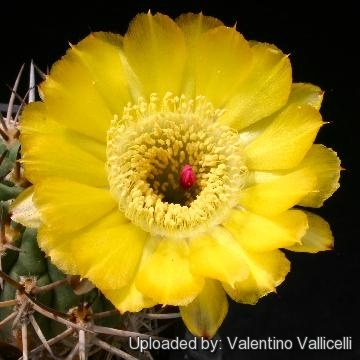 The specific name ''thionanthum'' means ''sulphur yellow flowers'' and it was originally applied to the yellow flowering form of this very variable taxon, but now - with the the name ''Acanthocalycium (Echinopsis) thionantum'' - the botanists identify a very variable, poliformic complex of plant (previously classified as separate, species, variety and forms) with variable colour of flowers and spines sizes. 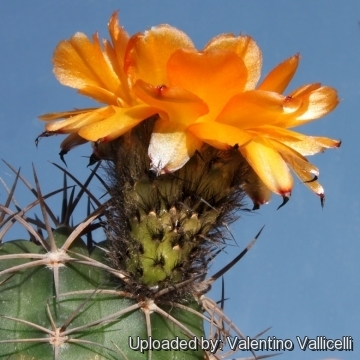 Origin and Habitat: Echinopsis thionantha has a wide range in Argentina in the provinces of Catamarca, La Rioja, Salta and Tucumán. A new disjunct location was found in southern Argentina. Altitude: It occurs at elevations between 1500 and 3000 metres above sea level. 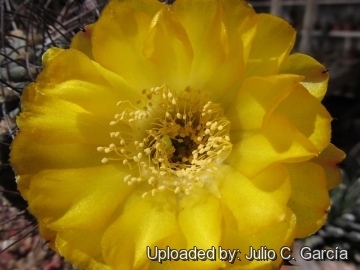 Habitat: Grows on mountain slopes in monte shrubland and prepuna, in rocky soil. The species is locally abundant. The only threat is local collection for ornamental use. 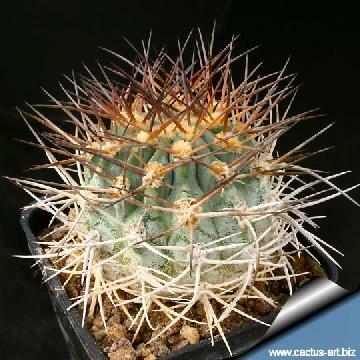 Description: Echinopsis thionantha (best known in cultivation as Acanthocalycium thionanthum) is a highly variable taxon with several forms. The specific name "thionantha" was originally applied to the yellow flowering form, but now comprises plant of variable colour of flowers and spines sizes. 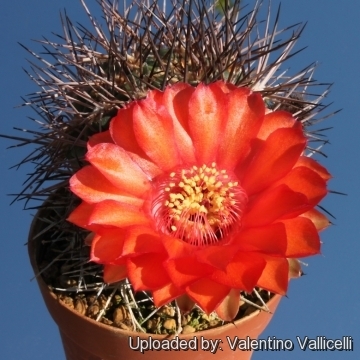 There are a number of varieties, but not all are universally recognized. Habit: It is usually solitary or slowly branching through basal shoots. Spines: 5 to 10 radial spines and 1 to 4 central spines, they are all more or less of the same length in a given plant (5-30 mm), but this species appears to be very variable regarding the length colour and number of spines in different populations. They are usually black or light brown at first, becoming grey or whitish-yellow as they age. Flowers: Bell-shaped, 5 cm long or less on lateral areoles, and the segments of the perianth are sulphur or lemon-yellow (but also white, orange or red), They have very hairy buds. The floral tubes have brown-white hairs/bristles and dark spine-tipped scales. 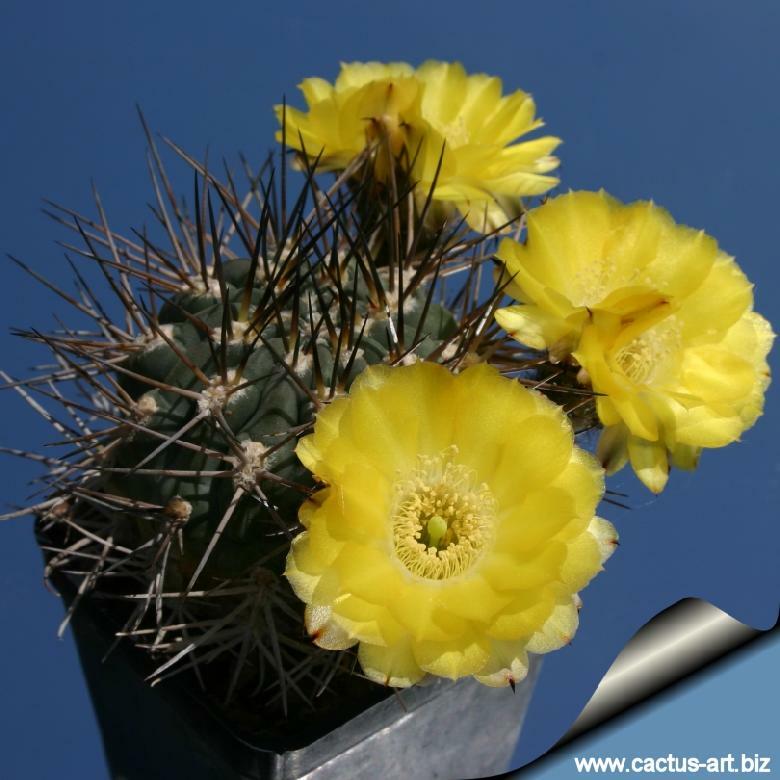 Notes: A full sun exposure is indispensable to keep plant compact with strong and colourful spines. 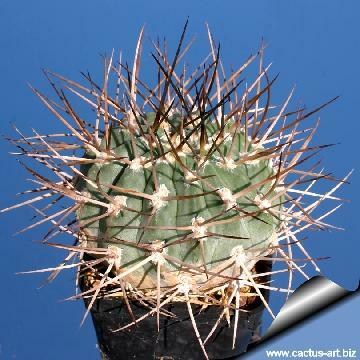 Without sun the stems elongate, remain green and don't form the characteristic powdery-grey coating. 5) Demaio, P., Lowry, M., Ortega-Baes, P., Perea, M. & Trevisson, M. 2013. 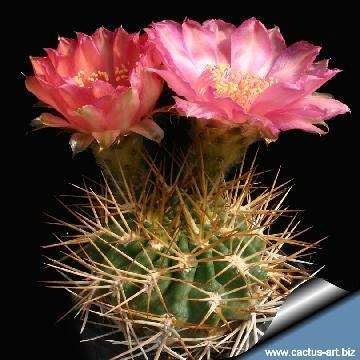 Echinopsis thionantha. In: IUCN 2013. "IUCN Red List of Threatened Species." Version 2013.2. <www.iucnredlist.org>. Downloaded on 05 January 2014. 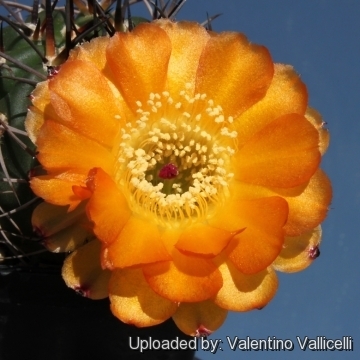 Cultivation and Propagation: Echinopsis thionantha is an easy to grow succulent, more cold tolerant than most and less fussy regarding soil conditions.